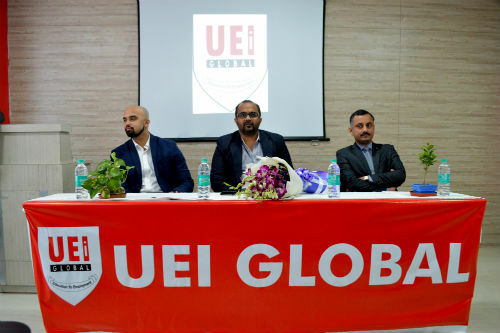 Lucknow: UEI Global Education launched its new, advanced and high class Hotel Management Campus in Lucknow. After educating and training the city of Lucknow for last 10 years, the institute has moved into a better-quality, a fully integrated, stimulating trainings labs & classrooms equipped with modern means of technology driving teaching aids like Training Kitchen, Mock Up Guest Room, Accommodation Training Room, Training Restaurant, Interactive Trainning Classroom, Computer Aided Classroom, etc. The Inauguration was embarked with ribbon cutting ceremony by the dignitaries. This was followed by a welcome address by honorable Chief Guest Kumar Shobhan, General Manager- Hyatt Regency and Namit Vikas, General Manager- Marriot, Lucknow. Manish Khanna, MD and CEO of UEI Global Education said while sharing his thoughts that, it has been a wonderful journey over the last decade embarking the training of more than 3,000 students in Lucknow that had widely earned the trust and faith amongst the student’s’ fraternity and parents while ensuring UEI Global Education become the first choice of students pursuing a professional Hotel Management programme in Uttar Pradesh. The new campus will take forward the legacy which will provide more integrated experiential learning to students who’ll become the finest professionals in the Industry. The new campus is equipped with all modern amenities which will help the students to get right mix of theoretical and practical knowledge. Explaining the purpose of opening a new campus he said, this development will introduce new teaching aids through technology, contemporary pedagogy with a stimulation of real environment advancing the student’s practical knowledge. He added that Hotel Management is a glamorous profession and offers a bright future both in India and abroad. Today, Hotel Management in India has become a promising choice as the students in search of exciting job opportunities and career are opting for this course instead of traditional courses like BA, B.Com, etc. The inauguration ceremony included the colour and tradition of the academic progression in hospitality. Namit Vikas, in his welcome speech pointed out the need of new hospitality education initiatives like UEI Global Education in Lucknow as it become easier for students to obtain quality higher education in Hospitality which would help them to meet the shortage of skilled labour in the industry. Now that UEI Global has taken a step forward to give innovative practical knowledge of Hospitality to young minds it will be much easier for those who aspire to build their career in the challenging field of Hospitality.